Pork belly, famous for making delicious cured and smoked bacon, is also great roasted in the oven. 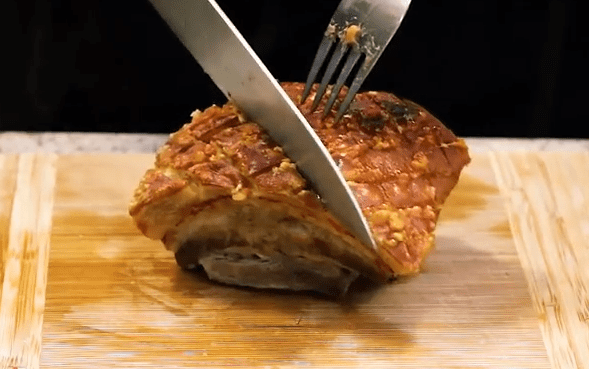 For the crispy crackling, ask your butcher to leave the skin/rind on the piece of pork belly. I have made this dish without the rind, but crunchy skin always makes everything better! This meat is fatty, but keep in mind, as you roast it, a lot of the fat will render out. It’s very versatile in terms of how you can flavour it. I personally like it pretty simple, with just salt, pepper and bay leaves. You can opt to do it fennel seeds, or with Chinese five-spice powder if you like! 1) Put your pork belly in a pot, skin side down. Add the garlic, chopped onion, herbs, crushed peppercorns and leaves. Fill with enough water to just cover the meat. Add some salt to the water as well. 2) Cook on medium-low for 45-60 minutes. 3) Remove the pork belly and pat the skin down with a paper towel. Generously salt the skin and wait for 5-10 minutes for the salt to draw out the moisture. Pat dry again. 4) Chop a large onion and put it in the bottom of a baking dish to give the pork belly something to rest on. Preheat the oven to 400F, broil (not baking with bottom element, you want the top element on to crispy the skin). 5) I roasted my pork for about 90 minutes but depending on the size that you purchased, you can add a bit more time. I would say you could go another 15 minutes if you needed to. 6) Let the meat rest 5-10 minutes to keep the juices in. Meanwhile, you can prepare your veggies and sides to go with this pork belly. I made some crispy lemon and rosemary potatoes, peas, mustard carrots and a quick chunky apple sauce with thyme, shallot and a splash of cider vinegar. 7) Enjoy the crackle of the skin and the delicious taste of this pork! Bon appetit! Previous Gluten-Free Orange and Almond Cake with Peaches and Pistachios! Next Lebanese Cinnamon Chicken with Rice and Nuts… featuring some of my new handmade dishes!